Permabull David Tepper of Appaloosa Management spooked investors at this year’s SALT Conference with his “I am nervous, I think it’s nervous time” pronouncement (read more at Zero Hedge or Business Insider). 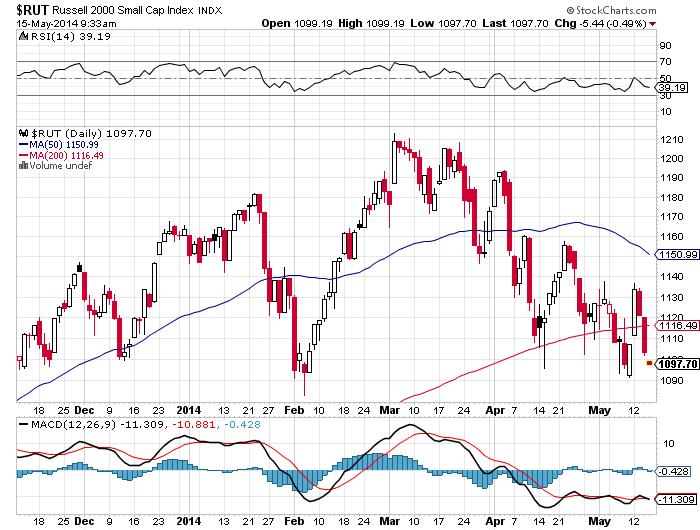 One year ago Tepper gained credibility with his prescient warning that short sellers were “digging their own graves,” as all the major stock market indexes continued rising for the rest of 2013. Now that Tepper is signaling something between caution and bearishness, suggesting that Central Banks have contributed to a mindset of “coordinated complacency,” it looks like a good time to review some hedging strategies for the downside-minded among us (I’ll use pre-open charts and prices from May 15 2014). 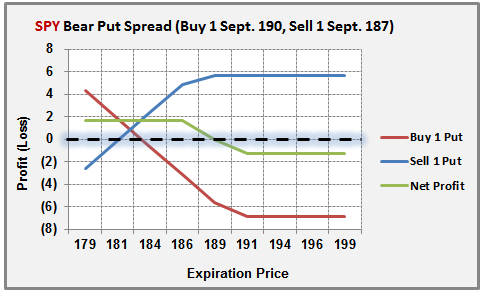 If you’re interested in speculating on a mild May correction, you might consider a bear put spread. 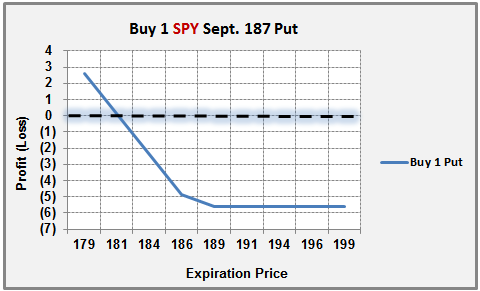 Below I’ve graphed the payout from buying 1 Sept. SPY 190 put ($6.92) and financing most of that position by simultaneously selling 1 Sept. SPY 187 put ($5.62). The position costs $1.30 net, and pays off a maximum $1.70 if the SPY declines by 1.5% or more). For those of us who are only short-term bearish and interested in hedging a long equity portfolio, buying the Sept. 187 put for $5.62 provides a little portfolio insurance, as shown below. 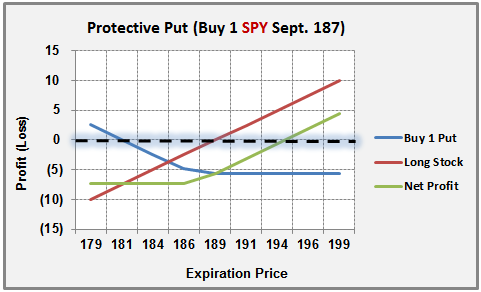 Based on a May 14 closing price of $188.75 for the SPY, this position caps your losses at -3.9%, including the cost of the put option. I recommend watching the Friday closing action closely — it will be interesting to see the extent to which traders will feel comfortable staying long over the weekend. 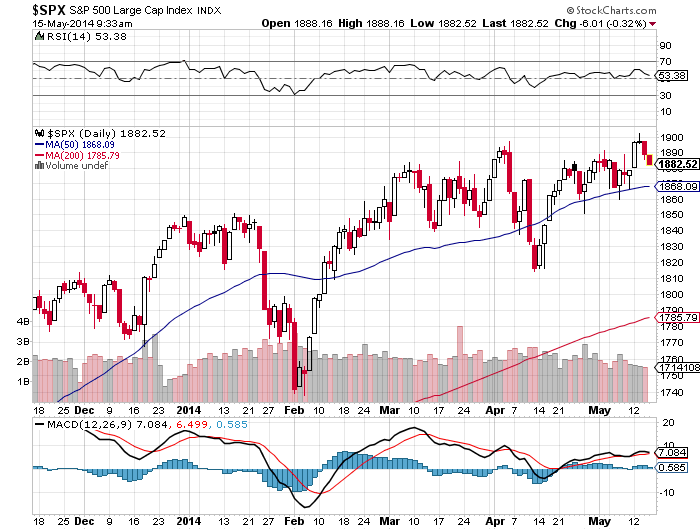 A weak final trading hour on Friday would add to the market’s nervousness. a solution which utilizes a needle to kill the hair at its root. removing unwanted hair on a light colored skin. notable for producing quality, amazing, and flawless results. They might be a good fashion declaration at home however, not in Spain. to glide down the aisle in it & look comfortable all day long. Also sign up for my pet blog and let me know if you have questions or concerns regarding your pets.